This is an expanded version of a post originally made in the Video University Wedding Video Forum. It’s a very basic look at the practical requirements for audio during a wedding shoot, plus a bit about what to do with your audio during the edit. Ed Note: While this article still has valuable information, some of it is dated. To learn the latest techniques for wedding audio see our new video The Video Guide to Professional Wedding Videography available as DVDs or Blu-ray. Your camcorder’s built-in mic is stereo…it records a slightly different signal to the left and right audio tracks. Almost any other mic you use will be a mono audio source, unless you go with a special two-mic array or an expensive stereo microphone. This is not a bad thing; stereo is not generally a requirement for this type of work. The key in capturing good audio is to get the microphone close to the sound source…usually two feet or less. You can record one mono source to the camera’s left channel and another source to the right channel. This doesn’t require a mixer, per se, but may require some audio adapters to get everything hooked up. Which brings up the question: What sort of adapters? Many different connectors have been developed for audio. The one most frequently found on professional equipment is the 3-pin XLR. Balanced XLR audio cables offer great resistance to noise pickup in runs over about 12 feet or so, and the connectors lock in place so they won’t accidentally get pulled out. Some pro equipment uses a 1/4″ phone, or phono plug. This can be mono (tip and sleeve) or stereo (tip-ring-sleeve) type. The stereo version can also be wired like an XLR connector for balanced mono audio. You may also run into RCA connectors. These are the ones you find at the back of your stereo. RCA cables aren’t used often in the field, because they are unbalanced and can pick up noise in long runs. Consumer and prosumer equipment particularly handycam-style camcorders use a stereo (tip-ring-sleeve) 1/8″ audio plug. It will require an adapter to mate this to an XLR mic. Wireless receivers may have a 1/8″ mike plug to go directly into the camera, or may need an XLR adapter, depending on the model you choose. At the distances we’re talking about here, a few inches, there is no technical benefit gained in using the XLR connector type, aside from the physical security it offers. If you need an adapter, a couple of good ones are the XLR to 1/8″ converter boxes sold by Beachtek, Studio One Productions, or Stage Tools. Since they have level controls, and two inputs, they also work as a rudimentary mixer. There are other adapters, from just about any type of male or female connector to just about any other type. You can find a nice assortment at Radio Shack, or at suppliers like Markertek which even sells a “goody box” of assorted adapters for about $50. Some camcorders (e.g., Sony VX-2000, -2100) turn off the built-in mic when you insert a plug in the external mic jack. Others allow you to use the camera mic as well as an external unit. If your camera doesn’t allow this, you can still record from two external mics, such as a wireless receiver and a shotgun. Connect these to the camcorder through a Beachtek adapter (if they are the XLR type) or through a dual mono to stereo “Y” adapter from Radio Shack if they are the 1/8″ type. A good wireless mic rig will run around $500. Popular units are sold by Azden, Samson, Sennheiser, and Audio-Technica. A good shotgun will be about $300, from Sennheiser, Sony, or Audio-Technica. A converter box, if needed, is about another $200. To all that, I would add a minidisc recorder as a backup audio source. You use it just like a wireless transmitter, by placing it on the groom or the officiant. Be sure the model you select has a microphone input jack; many portable MD units don’t. MD units are also handy when you run into a church that won’t allow you to use your wireless for fear of interference with the church sound system. I find a plug-on transmitter for a handheld mic to be a good tool for guest interviews at the reception. You can generally get one that’s matched to your wireless system for $150-200 or so. When using more than one wireless mic, remember that they must be on different frequencies. And when I say “wireless mic”, I mean a complete transmitter-receiver pair. You cannot have two wireless transmitters send to a single receiver unless it is a special two-channel type…and I haven’t seen any of these except for an entry-level model from Azden. While we’re on the subject of mics, let’s briefly discuss some common types and terms. – Omnidirectional. The mic picks up sound fairly equally from all directions. Most lavalier mics used for wedding work are omni. – Cardioid. The mic picks up sound better from a wide area in front of the mic element, and much less sound from behind. Good type for interviews. – Shotgun. An extreme form of cardioid mic, which picks up sound best in a narrow cone about its axis. Contrary to popular belief, a shotgun mic does not “pull in” sound from far away. It merely does a better job of cutting out extraneous sounds from other directions. – Parabolic mic. Are you kidding? At a wedding? – Dynamic mic. Sound waves move a diaphragm to which a small coil is attached. A magnet provides a field in which the coil moves, generating an electrical signal. No batteries required. Many handheld mics are of the dynamic type. You can generally tell by the lack of an on/off switch. – Condenser mic. Contains a capacitor consisting of two charged plates with a space between them. Sound waves vary the spacing between the plates, which varies the capacitance and produces an electrical signal of varying intensity. Can be made very small (almost all lavalier mics are condenser types). Requires either battery or “phantom” power. On Sony camcorders, this is also called ‘Plug-in Power’. – Phantom power. Power provided to a condenser mic (usually 48V DC) by the equipment it’s hooked up to (a camcorder or microphone mixer). – Minidisc (on officiant). No camera connected. How you set up your audio sources depends on 1) how many you have, and 2) the size and complexity of the venue. The really essential sources are a primary and a backup means of getting good audio of the vows. The other essential is: Monitor your audio. Wear headphones during the shoot. You may not be able to move about to fix a problem, but if your primary source goes bad, knowing that in advance lets you make better decisions. Before the shoot, be sure to check all batteries in wireless mics and condenser types. Replace if needed. I always replace 9V alkaline batteries if they test out at less than 8.9V, and 1.5V batteries if they are less than 1.5V. Fresh ones will test out slightly above their rated voltage. Some shooters take an audio feed from the church’s sound board. I prefer to use all my own equipment. That way, I don’t have to worry about someone else’s mistakes, just my own. But if you do use an audio feed, be sure to carry plenty of adapters of various sorts in your gear bag. You should also have a set of 40dB audio “pads” or attenuators, to convert from a line level signal (often found at the output of an audio mixer) to a mic level signal (a much lower level). Feeding a line level signal into your camcorder’s mic jack will cause highly distorted audio at best, and may damage your camcorder’s audio preamp at worst. One problem you can encounter in the field is hum, usually 60 cycle hum. If this happens, first check to see if your XLR adapter box has a ground switch setting. If it does, try the other position and see if that fixes the problem. Next, if you are running on AC power, try a different outlet, or disconnect and run on batteries instead. Also, try to electrically isolate the offending mic from the camcorder, perhaps with a layer of electrical tape. If you’re using a long cable, try moving it. If nothing works, use a backup audio source and do further investigation after the shoot’s over. A problem that can arise with wireless mics is radio interference. This could come from a source outside the church, such as a police or fire department, or a digital TV station. 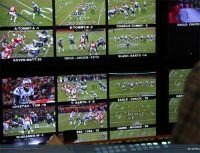 Or it could be interference between your unit and the church’s wireless system for the officiants, or for the hearing impaired. If your wireless unit has switchable channels, you’re in luck. If not, you’ll have to fall back and punt. If possible, check for interference by attending the rehearsal and talking to the church officials present. See if one of them can turn on the church’s sound system for a test. In post, capture audio/video together as usual. Minidisc audio will have to be fed into your sound card’s Line In port and captured separately, then synced up to the video in your editing program. Note: The DV format supports two audio sampling rates, 12 bit/32KHz and 16 bit/48KHz. Make sure your capture software is set to capture the correct type. In addition, some editing software doesn’t like to handle material of different sampling rates. If necessary, re-sample the audio in an audio editing program like Sound Forge before editing. You can take each track of monaural audio and put it into both left and right speakers (exactly how to do this will vary depending on your editing software). There are also tricks you can do to make the mono sound more like stereo, if you’re so inclined, but these are generally not necessary. During the edit, you can switch between and/or mix audio from different sources for the best results. You can also add background music. This is usually done only for photo montages, highlights and recap segments and the like, but may occasionally add impact during reception or ceremony footage. If there is dialog, be sure to keep the background music level low, so it can be heard. Remember: Good audio is at least half of a good video. Good luck, and happy shooting and editing! The latest techniques for recording good audio in wedding videos are included in our new video entitled The Video Guide to Professional Wedding Videography. This new 2014/2015 version is available in Blu-ray or as two DVDs. This ten part video guides you through all the steps you need to follow to produce a client-pleasing $1000 plus wedding video. The entire video is in HD. 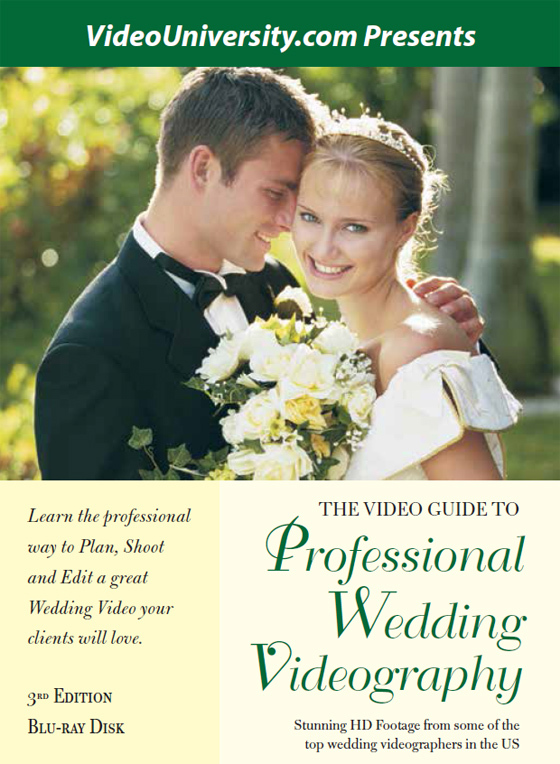 Expert instructors show professional ways to plan, shoot and edit a wedding video that delights clients. Extensive instruction on how to do professional audio, shooting, equipment choices, editing, tapeless workflow, backup and much more.